Happy Monday, friends! I have two treats for you – long-awaited ones…..check out both all THREE videos! Quite a long while ago I created a card inspired by Van Gogh’s Starry Night….and I asked way back then what artist to tackle next. And I am finally getting around to Monet!The piece isn’t a replica of one of his paintings, but I did create an impressionist scene inspired by his style and a photo of the Claude Monet Foundation lily pond. It was way harder than I expected! I did like it enough to make it available as a print in my Society6 store HERE. 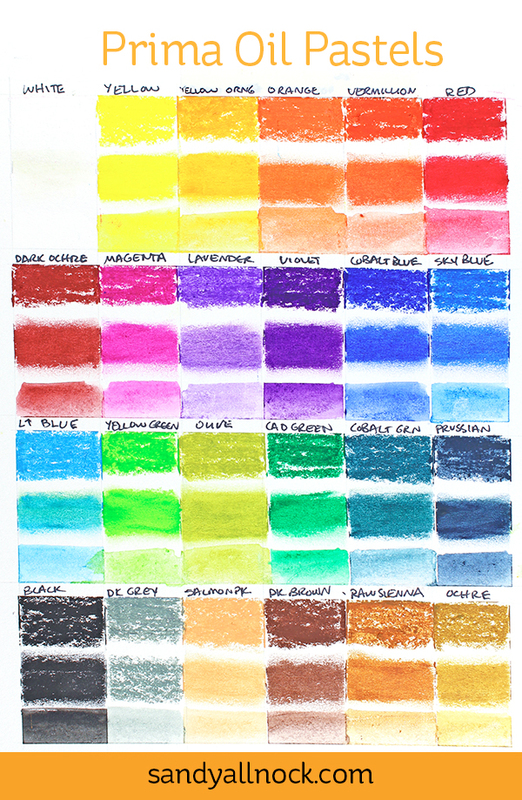 As soon as I saw Tim demoing the Distress Crayons at CHA, I knew I was going to try this with the medium- and I want to say a huge thanks to Tim for sending the crayons along to me! Watch the video below or click HERE to watch in HD on YouTube. 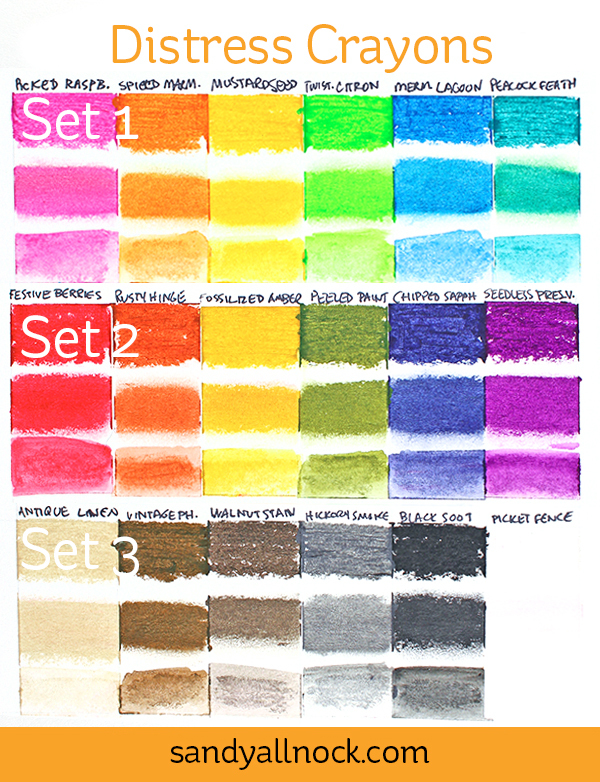 I’ve received so many questions on these crayons – how to they compare to the Prima Oil Pastels, and to Gelatos. I had to go buy a couple Gelatos just to run the test…you’re welcome! 🙂 I don’t have a definitive opinion about which I prefer….for different uses, each one has its place. Hopefully seeing a few of the properties of these will help you decide which is right for your project! Watch the video below or click HERE to watch in HD on YouTube. My friend May is excited about her new button line (which I featured in THIS video) – and I wanted to let you know her products are now available at Ellen Hutson. And only there so far…if you’ve been waiting to support May, now’s your chance! I’m so proud of her! Thank you for putting this all together! Loved seeing your process! Thanks Sandy – I see that Tim Holtz gave a link to your comparison on Facebook!! Hope you get a lot of new followers! You are very talented, not many could do the Water Lilies with Distress Crayons. Sandy, thanks so much for doing the comparison. I recently bought some Gelatos and it was nice to see that they become permanent when heat set. I absolutely love the Water Lilies piece you did! You are such an amazing artist! Sandy, This amazing! You are so talented! Your faux Monet is BEAUTIFUL!!! Thanks too for sharing the comparison – very helpful!!!! You make the Monet look alike soo easy Sandy. Thanks for sharing with us. I have a collection of the gelatos, so I really feel like I need to use them. I’d love to try the other two, but money is tight right now. What bcparkison said! You make it look so easy. I’m going to give it a go and not show anybody yours. My first reaction on the waterlily video was…I could do that! ,but in the end you ,being the artist that you are really pulled it off and no I probably can’t do that. We can always count on you. so beautiful and amazing to watch you paint it (crayon it?) whatever, you are amazing. I so enjoyed watching you work!!! I have been wondering what to do with the crayons besides backgrounds… Not that I could ever achieve anything like this! But you are an inspiration to me to get practicing! Thanks Kiddo! Wow What a beautiful piece of art. Enjoyed watching you create. Thank you and thanks for the comparison between the three products. Such beauty! Thank you so much. First, your Waterlilies video is amazing, as is your finished work. Second thanks for the comparison, it really helped me understand the differences between the three mediums. Thanks teacher for showing us how to compare and document differences… I love the fingerprinted monet inspiration! What a video! I’m in awe over how you used the Distress Crayons to create that beautiful Claude-inspired scene. I was helpful to me to see you in action using the Crayons. Thank you for the effort you put into the comparisons. I can see how you came to the conclusion that there is no favorite, each having its own place. Yay Sandy! Thanks for doing the comparison, Sandy. Magical painting. Great videos. 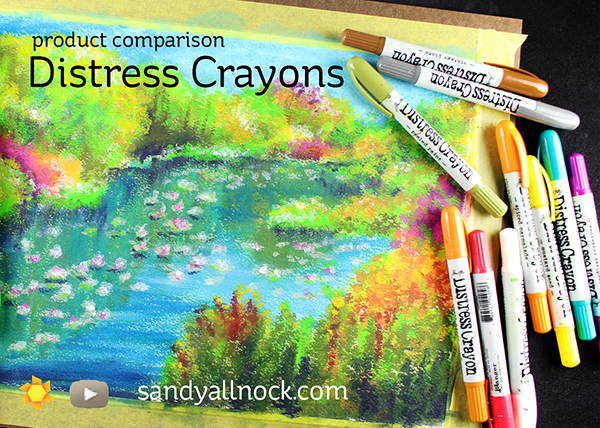 Beautiful distress crayon painting and love the comparison video…a lot of information, thank you. I enjoyed getting the sneak peek on this through Patreon. I’m not sure the crayons would be for me, but I certainly look forward to seeing more from you and others that might make me change my mind! Thanks for the comparisons. Great painting.